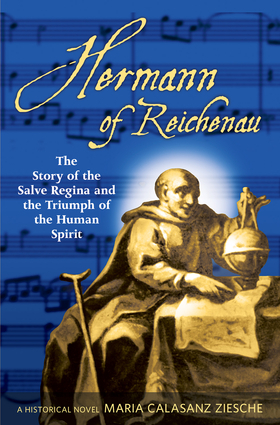 The amazing life story of a quadriplegic monk during the Middle Ages One of the most brilliant minds of the Middle Ages, Herman of Reichenau was a severely crippled monk who, though he was marginalized and even mistreated by his fellow monks, is celebrated to this day for his groundbreaking scientific work and the beauty of his musical compositions, among them "Salve Regina." A quadriplegic since childhood and brought to the monastery at an early age, Herman lived at one of the most influential and powerful Medieval monasteries, situated on a small island in the Lake of Constance on the modern-day border of Austria, Switzerland, and Germany. As he grew and studied, investing his hope in the medical promises of the time to alleviate his physical ailments, his days meandered between deep despair and his growing faith. When his music was played and sung, an exhilarating joy entered the whole community, and the monks came to see the extraordinary spiritual strength, beauty, and true happiness coming from the weakest among them. A deeply encouraging book about the life of a man who overcame numerous obstacles, this work captures the grandeur of the human spirit. Maria Calasanz Ziesche was a high school teacher and member of the German Congregation of the Sisters of Our Dear Lady. She is the author of several novels set in the middle ages.